It really helps to get a hand on printer logging. If you think about it, there are just so many departments that have constant access to office printers, as well as printing paraphernalia. At first bat, you would not really question the necessity of printing because printing is indeed a necessity in the office. This is especially true when you are operating an enterprise in the publishing industry. However, if you really think about it, outlining all of your expenses when it comes to printing - from ink, cartridges, and paper right down to the cost of purchasing the printer itself -, you just might be surprised how much you spend on just printing each month! It is important to keep track of all printing activities that take place in the office setting. By using printer logging software, you can do this endeavor more efficiently. Now, this goes without saying that there are employees who are just a little bit abusive when it comes to using office equipment and when it comes to printing. Our print logging software does the rest! How will the printer logger save your company money? "We purchased the printer logger from AGG Software over a year ago, and it has been a valuable addition to our office management system. The controls are intuitive and the operation is very reliable. AGG Software was willing to work with us to get exactly the functionality we needed. To top it off, the price was unbeatable. I would definitely recommend to anyone looking for this printer logging software to take a good look at what AGG Software has to offer." Maryan Engr. and Controls Co.
Read more printer logger testimonials, Download FREE trial or Order Now! Our printer logger keeps track of who uses what printer at what time, let alone how many times in a day each of your printers is used! Detailed reports are then stored inside a database that you can easy access to control abusive users. 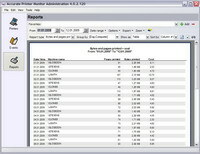 The program stores all details about printer events; therefore you can get detailed reports! Is this printer logger can be used in big and medium organizations? Yes! Our printer logger can be installed on one server and used together with a centralized database and acquire data from several local or remote printers simultaneously! Unlike other printing logging software on the market, this printer logging tool uses performance, robust and scalable architecture with many plug-ins, which you may easily adjust to your needs. Different from the rest? You bet. Unlike other software tools our printer logger software provides detailed reports, which you can adjust to your needs too! Is the printer logger cost effective? Yes. The printer logger usually pays for itself within several months. It extremely reduces the time required by the IT specialist to monitor the printer state in the big, middle or small company. It can significantly reduce monthly print cost up to 10%, because allows eliminate printer usage for personal use and help to change employee behaviour and involving them in the cost-savings process! The savings can be very real. 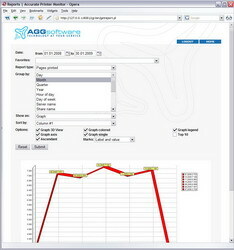 "We have been using the AGG Software printer logger during the last year having excellent results. We were able to save Hundreds of Hours per year by fully automating our printers monitoring job and save many Thousands of Dollars per year in saved time. I only wish that I had found Accurate Printer Monitor sooner because we could have saved so much more Time and Money. I highly recommend that you buy this printer logging software." 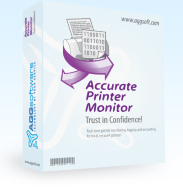 "I have purchased Accurate Printer Monitor in the past and have fully tested it within our offices. I've added this required tool to our maintenance department due to its unique ability to read information about all printer events with no complicated setups making it ideal for our maintenance staff. It's assistance to maintaining printers makes it indispensable!" "I have been using the printer logger on and off for the past several weeks and am very pleased with the software. So happy with this tool, I have added money to a budget, which is out for approval, to purchase another license by the end of the year for our other office. Thanks for all the tech support and I hope to order another Accurate Printer Monitor soon."